BIO: In March 2004, Matthew Malin and Andrew Goetz opened the brands first store in New York’s Chelsea neighborhood with a modern apothecary approach to luxury skincare. Their mission was simple: To provide easy-to-use treatments that are both gentle and effective. For all skin types, women and men. CT: Matthew, Andrew – tell me a little bit more how you guys met? AG: We met the old-fashioned way; in a bar. It was back in the days when the East Village was still the East Village, and Gay Bars were dark and smoky, and full of mystery. It took a few attempts to charm Matthew, but eventually I did – a it’s now almost 25 years later. CT: What is the opening story to your brand, MALIN + GOETZ? AG: Matthew is the Beauty doyen. My background is from the design (architecture/furniture) world. When Kiehl’s was sold to L’Oréal, we thought there was a great opportunity to create a brand based on modernity and simplicity, and with a focus on sensitive skin – as Matthew suffers from a number of skin sensitivities. A true combining of both our respective worlds. CT: For those that haven’t heard of MALIN+GOETZ, how would you describe the brand? MM: Luxury skincare made simple. 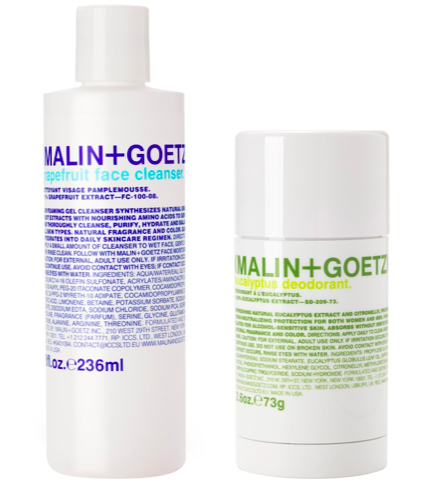 CT: In such a saturated market, what do you think makes the MALIN + GOETZ brand stand out? MM: First, we are an authentic. We have a story to our brand and it is a family owned New York City based brand that really comes from the lives of Malin and of Goetz as a couple. Our philosophy is for Simple Skincare Solutions, focusing on sensitive skin (mine in particular) as a starting point. Finally, our modern apothecary approach offers the best of tried, true and trusted natural ingredients and advancements in technology to product the most gentle and effective treatment available over the counter. No false claims in what we produce. AG: Saturated indeed. I would also say we stand out on a number of fronts. Matthew and I personally develop each and every product to the highest standards. We only include what works, and what’s healthy. No unnecessary ingredients. We think our packaging looks wonderful in every bathroom. All our stores are unique; not two are alike – we are really passionate about design and architecture and love exploring different solutions. Lastly, there really are a Matthew Malin and Andrew Goetz, and they care very much about their brand. CT: From the range, what is the top selling product? MM: Weirdly, it is our Eucalyptus Deodorant (below right) is one of the top selling products. This product is formulated without alcohol and aluminium, two ingredients that many customers look to avoid. However, it is our skincare—our Grapefruit Face Cleanser (below, left) and Vitamin E Facial Moisturizer—that I would say we are known for. AG: The Grapefruit Face Cleanser and Vitamin E Face Moisturizer have been our go to products from day one. And our hair products have an incredible cult following. We really do sell across all categories. CT: You design skincare for men and women with a range of skin concerns, how do you do your research in making a new product? MM: That’s a BIG question! First, as a beauty professional in NYC for my career, I have also suffered from rosacea, eczema, seborrhea and fragrance allergies. So, these issues of acute irritation and skin ailments guides our initial development. If the most sensitive of skin can enjoy the treatment, then it is a winner. We also work with many chemists to discern traditional, natural ingredients that are tried and tested along with trusted technology to create efficacy and effectiveness. We are not afraid to use science to alter products to be both gentle and effective. Hopefully this offers some insight to the painstaking process that can go on for often one year of development. AG: It is important we decide what kind of product or problem we want to address. Then we work diligently with our chemist to create the formula. We as a brand are not interested in trends, but rather creating solutions for skin issues and problems. CT: One of many things I love about your brand is the packaging – talk me through the design process of the product packaging? AG: We referenced old 19th and early 20th Century glass apothecary bottles. We loved their simplicity and elegance. But they were merely an inspiration, we did not want to create something pastiche. Our graphic designers took our inspiration and modernized those bottles to be the beautiful graphics that we have. MM: Most design elements come out of Andrew’s past life. However, we have both directed the concept as a modern interpretation of a traditional apothecary and chemist’s labels. They are text intensive, offering an honest view into the contents of the formula. And, as I already mentioned, our names—like those of old time chemists—become a “formula” for balance. Form follows function. We have also color coded products by category: blue is face, green is body and red is for hair. CT: You have currently got 9 standalone stores between London and across the United States, do you have any plans in the future to expand into new territories across the globe and if so where is next? AG: The US being as big as it is, has quite a bit of potential. As does London – it’s very unique in how it’s almost a collection of villages. We have plans to open a store in Honk Kong next year. And we’d eventually like to open stores in some key European cities, as well as in Japan. CT: Each MALIN + GOETZ store has a different yet unique design or setting, tell me more about the store design process and how do you pick the store locations? MM: Our apothecary’s offer unique neighbourhood settings for how our products may look in your environment, changing from location to location. We work hard to ensure that they feel appropriate to the fabric of their surroundings. For instance, our store in the neighbourhood of Islington in London feels both traditionally Edwardian and stylishly modern at the same time. AG: Like Mathew is saying, we generally like neighbourhood locations where we can serve a local customer. It’s important for us to be part of a community. So that one of the overriding ideas when we pick a location. That being said, we are not immune to looking at popular shopping districts, as people are shopping differently today than they did even a couple of years ago. 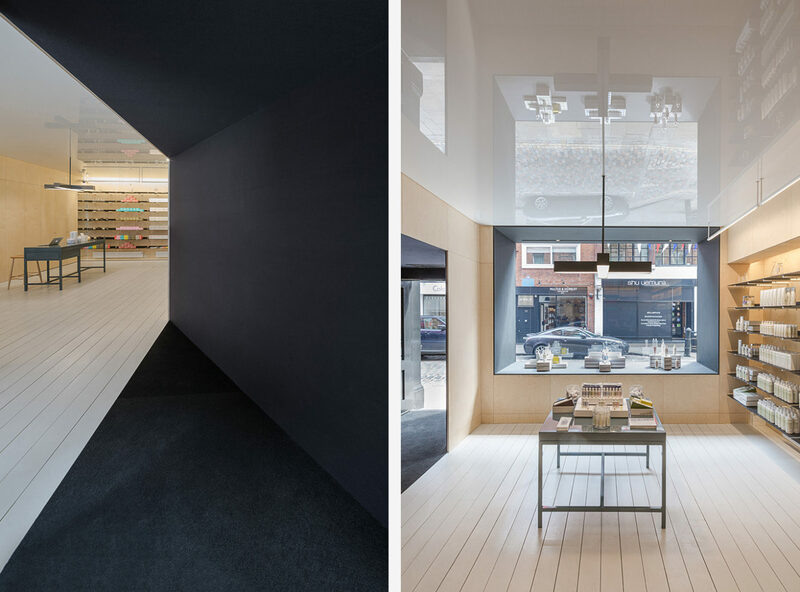 Photography: Dirk Lindner via thespaces.com of the MALIN+GOETZ Covent Garden store. CT: You’ve recently just launched Advanced Renewal Cream; how long did it take to make this product and what difference does it have to other creams in the skincare range? MM: It is our most advanced face cream and expensive item to date, addressing lines, wrinkles, firmness, hydration, etc. The Advanced Renewal Cream is highlighted in a beautiful blue apothecary jar to identify it from our other products. AG: It is indeed our most advanced face cream. It’s packed with lots of nourishing ingredients and peptides to help with cellular renewal. It took a good 9 months to develop and it is the most expensive skincare in our range. CT: Your Pug Mr Greenberg is quite clearly your mascot of yours! With your love of Dogs carved into the DNA of the brand (and with a Dog Shampoo out), how did the partnership with Battersea Dogs Home come around? AG: While we are involved with many animal and dog charities, we can’t take credit for having reached out to Battersea. The credit goes to our UK Country Manager, Simon Ford. It was a great idea, a great cause, and could not be more on brand. MM: We also have partnered with many animal charities in the US, as our home is in New York City. Mr. Greenberg is from the Green Mountain Pug Rescue in nearby Killington, Vermont. So it was important for us to partner with a similar organization in the UK. It feels like a match made in heaven. CT: You are partners in life and partners in work – how well do you both work together? AG: We work hard at work, and work very hard at working well together. Not always easy, but we’ve found our rhythm. We do our best to avoid any Sid and Nancy moments, but we are not perfect. We recently moved to a new space where we each have our own offices. That’s definitely been a well appreciated benefit. MM: 24 years in life and almost 14 in business, I think that we can say that we work well together. Like any partnership, it is not without its challenges. Finding time apart is a healthy effort. We also divide responsibilities. Andrew is focused on creative and manufacturing and I oversee sales and product development which only makes sense to test on my sensitive skin! CT: What has been your biggest learning curve since launching your brand? MM: Developing a brand and profitable business takes time. AG: I don’t know that there is one single biggest learning curve if I am really honest. Each chapter of the business presents different and new challenges. That being said, luxury distribution, particularly in the US market has changed quite a bit. Luxury used to mean exclusivity – and of course there was often a price tag attached. Today luxury is all about convenience. So, adjusting to the new digital centric trading environment is definitely a big learning curve. 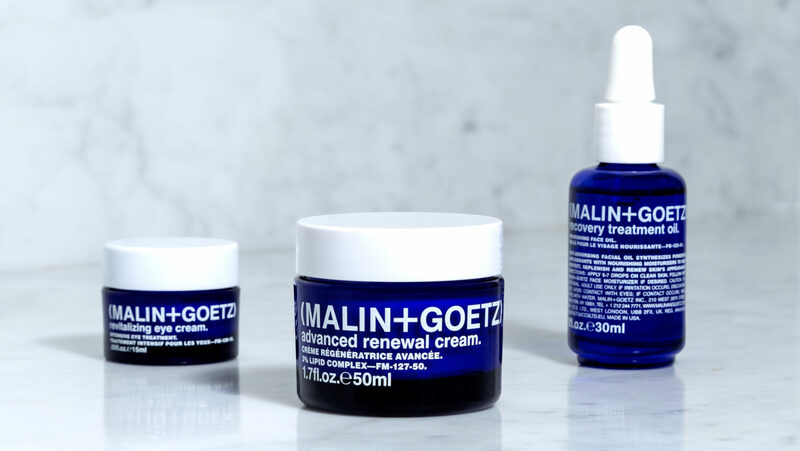 MALIN+GOETZ’s latest Advanced Renewal cream, eye cream and recovery treatment oil. CT: What advice can you give a budding entrepreneur who wants to set up their own business? MM: Speaking purely from my personal experience, never having been in business for myself, is that taking the risk to do it, is, well, worth doing! I also came from ten plus years of varied experience within the beauty industry that prepared me to do exactly more of the same now for myself. So, I am not a serial entrepreneur, and, all of these details mattered. That’s another thing: there is no right or wrong way or model, and if you are a dreamer, this can be liberating. AG: Passion is key, but doing what you know, and knowing what you do is paramount. Assuming those boxes have been ticked off, be prepared to work harder than you have ever worked in your life. And then some. But there is no substitute to loving what you do! CT: How do you think social media helps any business today? MM: PR and media have ALWAYS been key drivers for business. Social Media, in my opinion, is another form of the same idea—getting the word out there. And, it is here to stay so we better embrace it. AG: Social media has the potential to bring tremendous exposure to a business. It brings a personal as well as an editorial story to a brand. CT: What is your favourite neighbourhood in New York? AG: I have lots of favourite neighbourhoods in New York and even in Brooklyn. I still have a special place in my heart for the East Village and Lower East Side. Tons of great restaurants, an incredible energy. In my fantasy life, I’d like to live in Cobble or Boerum Hill, or even Brooklyn Heights. The architecture is really beautiful, and it’s much calmer than Manhattan where we currently live, and have lived for the better part of my life. MM: We live and work in Chelsea, and, it is quite dynamic. Chelsea is the home of the Highline Park, the gallery district, great restaurants, and the original MALIN+GOETZ shop! Use three words to describe each other? Andrew on Matthew: Smart, determined, kind. Matthew on Andrew: Funny, smart, detailed. CT: What is your best beauty tip you can share? AG: Less is more. Don’t over-do it. Beauty only becomes complicated when you make it complicated. MM: Wash your face twice per day, every day, with an effective and gentle cleanser. It is tough to have good skin without doing the work. CT: What was the last song you downloaded? MM: I have not downloaded a song in years… I did seek out a YouTube video for the Waterboys after hearing “The Whole of the Moon” on Sirius recently. Does that count? AG: Sadly, I with the likes of Spotify, I rarely download songs anymore. But I did download a bunch of Leonard Cohen albums when he died last year. He had a way of making me feel really nostalgic. CT: Where do you like to go on vacation? AG: One of my favourite places in the world to go is Positano. It’s just so spectacularly beautiful – and of course the food and wine; it practically paradise. That being said, I’m fairly curious person, so I like discovering new places. You don’t know what you don’t know. I would love to spend more time in Japan, as well as exploring South Asia. But frankly, one of my favourite holidays is heading up to our farm house in the Hudson Valley and idling away the hours gardening, cooking and reading. It’s honestly one of the best holidays we can take. MM: After a long work week in NYC, it often feels like a vacation just heading to Hudson Valley. Otherwise, I never tire of Rome and hope to one day be a permanent tourist there. This entry was posted in Interviews and tagged Andrew Goetz, Interview, MALIN + GOETZ, Matthew Malin. Bookmark the permalink.